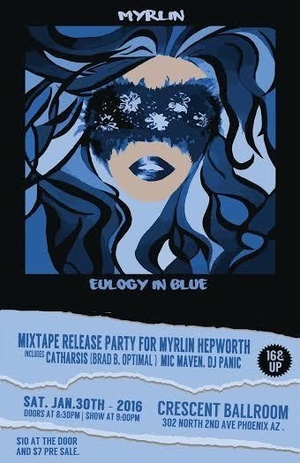 Attend Myrlin Hepworth’s Eulogy in Blue mixtape release party, also featuring Catharsis (Brad B. Optimal), Mic Maven, and DJ Panic, on Saturday, January 30th at 9 pm at Crescent Ballroom in Phoenix. Tickets are $7 pre-sale. Doors open at 7 pm. See more on our Facebook event page. Myrlin is a poet,emcee, and teaching artist and has written and performed across the United States. In 2009, the Arizona Commission on the Arts selected him for its roster of Teaching Artists. In 2010, he became the first undergraduate teaching artist for the Young Writers Program at Arizona State University where he received his degree in English in 2011. In addition to visiting nearly thirty high schools each year, Hepworth makes a living with his art by performing at universities, youth centers, group homes, museums, and theaters. He has competed on three National Poetry Slam teams and co-founded and coached the Phoenix youth team to consecutive appearances at the Brave New Voices International Poetry Slam. In 2011, Myrlin released his first collection of poems, From the Rooftops and in July of 2013 released his first hip hop mixtape entitled The Funky Autopsy.